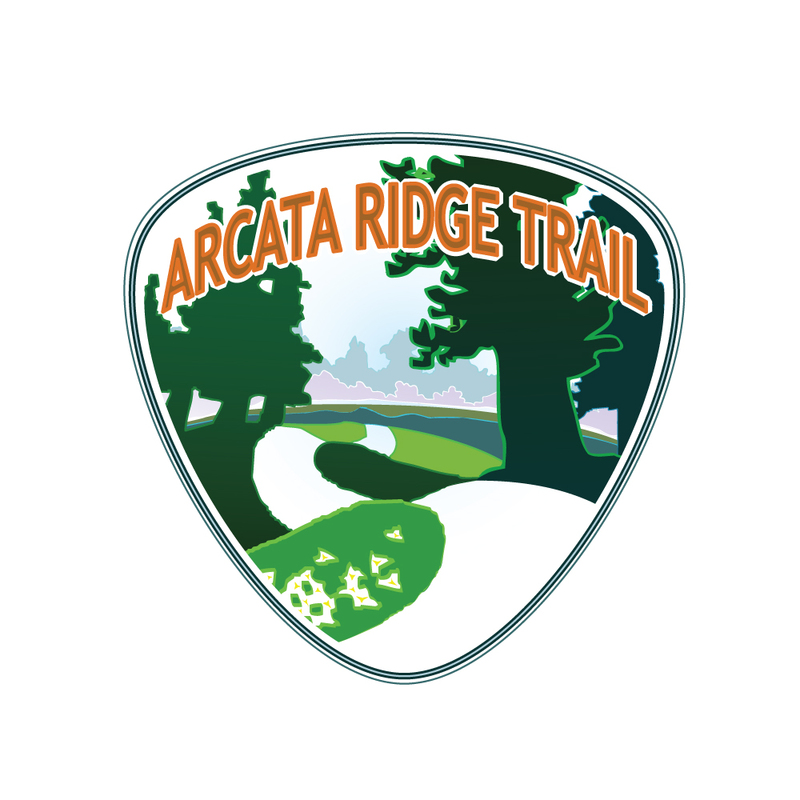 Arcata Ridge Trail Logo by Dave Held. ARCATA COMMUNITY FOREST – Attention ghosts, goblins, vampires and witches: Get ready for the Race for the Ridge Trail Festival in the Arcata Community Forest on Saturday, Oct. 30. The spooky fun starts at 9 a.m. with the Run for Your Life 5K Run/Walk sponsored by the Jogg ’N Shoppe and 6 Rivers Running Club. Beginning promptly at 10 a.m., your little ones will enjoy wearing their costumes for the Ghosts and Goblins Kids Ride/Race and Rodeo. As the noon whistle blows, participants will compete in the Ichabod’s Wild Ride, sending bike racers into the Pain Cave through Arcata’s Community Forest for three hours of suffering! Over 200 racers including top collegiate athletes from all over the western U.S. are expected to compete in this multi-lap race (each 7.25 mile loop features 1300 feet of climbing)! Bring your lawn chairs and blankets because from noon until 6 p.m. you’ll have the opportunity to listen to live music by Sierra Rose, The Rezonators, The Jim Lahman Trio with Ron Perry, Black Cat Bone and Full Moon Fever. Tantalize your taste buds on BBQ from Blackberry Bramble or wet your lips on a frosty beverage from Lost Coast Brewery, Mad River Brewery and Six Rivers Brewery. If you’re tired of sitting, take a stroll in the Haunted Forest or for the more adventurous try the climbing wall provided by North Coast Adventure Center. Spectators are encouraged to wear a costume and showcase Humboldt wackiness. Proceeds from the Race for Ridge Trail Festival are designated to the Arcata Ridge Trail Project. The Arcata Forest Fund Committee has been working on raising funds for the purchase of key parcels between the Arcata and Sunny Brae Community Forests. When complete, the four mile-long Arcata Ridge Trail will connect the Arcata and Sunny Brae Community Forests together and beyond to West End Road. Donations are held in the Arcata Forest Fund at Humboldt Area Foundation. The Arcata Forest Fund provides a source for private donations to assist the City of Arcata in purchasing land adjacent to the Arcata Community Forest and the Sunny Brae Forest. Private contributions help the City by providing leverage for Federal, State and non-profit foundation grant funds. The acquisition of the Arcata Ridge Trail parcels will provide permanent protection of open space, timber resources and watershed values, wild life habitat, corridors and access for recreation. cityofarcata.org/arcata-ridge-trail. 9 a.m. Run for Your Life 5K Run/Walk pre-register at the Jogg N’ Shoppe 1090 G St. in Arcata or at the event site prior to 8:30 a.m.
Held at Redwood Park in the Community Forest, the 5K event will be comprised of three 1-mile loops beginning and ending in Redwood Park. 10 a.m. Ghosts and Goblins Kids Events. Kids’ Bike Rodeo followed by a Kids’ race, a costume contest and Halloween activities. Bring your bikes, helmets and costume. A limited number of bikes will be available for use during the festival, thanks to our sponsors. Noon Ichabod’s Wild Ride XC Mountain Bike Race begins in Redwood Park in the Community Forest. Top collegiate and citizen racers from throughout the Western U.S. will compete in a multi-lap race in the Arcata Community Forest. Each lap features 1300 feet of climbing, and a variety of distances are available to suit all abilities and fitness. Beginners will do one 7.25-mile loop; collegiate C and D racers will do two 7.25-mile loops. Intermediate and collegiate B racers will do three 7.25-mile loops. Experts and collegiate A racers will do four laps for a total of 29 miles and 5200 feet of climbing! There are a number of excellent technical sections for cowbell ringing, screaming and cheering on the racers. All-Day Events on Saturday Noon to 6 p.m.
Bike Demos from Kona, Niner and others. Additional mountain biking events will be held on Sunday, but without beer or food vendors. This race will be 20-45 minutes of brutal effort (depending on your category). You will experience a fast pace, close finishes and maximum efforts from beginning to end, with a short, technical course through the redwoods. This spectator friendly race can be seen almost entirely from the meadow at Redwood Park. Downhill (No shuttle. All riders need to ride up to start. Plan accordingly.) Finish in Redwood Park. About 500 people are expected to attend the festival, including college students from all over the western U.S. who will be competing in the Humboldt State Cycling Club’s organized collegiate events. Registration for the MTB races is at Revolution Bicycle, 1360 G St., Arcata on Friday, Oct. 29 until 9 p.m. or at the event site beginning at 9 a.m,. on Saturday. This entry was posted on Wednesday, October 20th, 2010 at 1:59 pm	and is filed under News, Community, Environment. You can follow any responses to this entry through the RSS 2.0 feed.